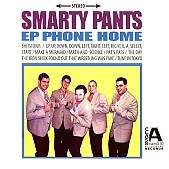 Zany, tongue-in-cheek nerd-pop, which toggles between fun-lovin' pop punk, retro rock, and straight ahead pop, Smarty Pants' comically titled EP Phone Home is a guaranteed smile when you listen to their corny, good-time songs that will make you laugh and forget your worries for a bit. And with a penchant for writing clever hooks, the band will also have you singing along in no time as you hear yourself shout "It will rain down like shitstorm". I'll give this a B.